Ierapetra, the largest city in southern Crete, is located at the narrowest crossing of the island, and is easily reached from Agios Nikolaos. There are daily buses from Iraklion , Agios Nikolaos, and Sitia to Ierapetra. There are local buses to the villages west of Ierapetra (See Transportation). 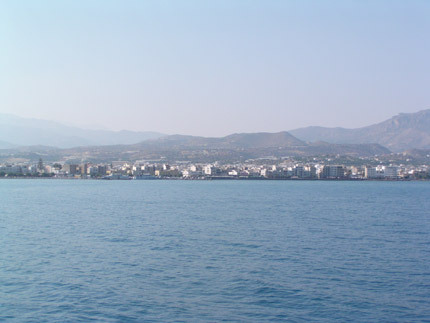 Ierapetra has many hotels, rooms for rent and tavernas and the area around the harbour has many restaurants. There are also tours by boat to the island of Gaidouronisi (Donkey Island). The ancient city of Ierapytna (a Doric name) stood on the site of present day Ierapetra. It was in a strategic location on the shortest north-to-south axis of Crete, but it had strong rival cities, Praisos to its east and Viannos to its west. Praisos was the most powerful town of eastern Crete in about 300 B.C., but Ierapytna destroyed it in 155 B.C. and became itself the city with the most land under its sovereignty in all Crete. It resisted Roman invasion and was the last Cretan city the Romans conquered. After surrendering, Ierapytna became an important port due to its proximity to Egypt. 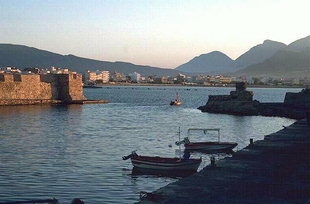 Ierapetra maintained its importance during the first Byzantine period, but was destroyed by the Arabs. The Venetians built the fortress and harbour and in 1626, they enlarged and reinforced it. Recently, the castle was restored by the city. In 1647, the Turks captured the town. 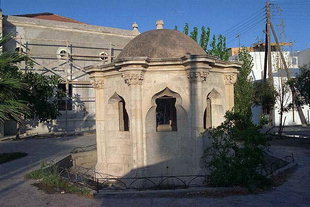 You can still see remnants of their occupation in the old town near the harbour, such as the remains of a Turkish fountain in front of a derelict mosque (now being renovated). According to legend, Napoleon spent the night here on his way to Egypt in 1798.